Major Western countries have decided to expel senior Syrian diplomats following the killing of 108 people in the Houla region of Syria on Friday. France, the U.S., UK, Germany, Italy, Spain, Canada, Australia and the Netherlands all took action against Syria’s envoys. Most of the victims in Houla were summarily executed, the UN says. Residents said pro-government shabiha militia had entered homes and opened fire indiscriminately. Syrian President Bashar al-Assad told UN-Arab League peace envoy Kofi Annan in Damascus that terrorists had stepped up their operations across Syria, including killing and kidnapping. His remarks were quoted by state TV. UN human rights spokesman Rupert Colville said initial investigations had suggested that most of those killed in the village of Taldou, near Houla, were summarily executed. Rupert Colville said 49 children and 34 women were among the victims. UN observers who visited Taldou said many of the victims had been killed by close-range gunfire or knife attacks. Eyewitnesses said pro-government shabiha militiamen had carried out the killings. Survivors said they had hidden or played dead. Syrian leaders insist that the massacre was the work of “terrorists”, aiming to derail the peace process and provoke intervention by Western powers. US state department spokesperson Victoria Nuland announced that the Syrian charge d’affaires in Washington had been given 72 hours to leave the country. “We hold the Syrian government responsible for this slaughter of innocent lives [in Houla],” Victoria Nuland said. Canada denounced the Syrian government’s “heinous and murderous acts” while Australia described the Houla massacre as a “hideous and brutal crime”. Spain talked of “unacceptable repression” and France’s new Foreign Minister, Laurent Fabius, described President Assad as “the murderer of his people”. The French government said “the murderous folly” of the Damascus regime threatened regional security. The Dutch declared Syria’s ambassador to the Netherlands, who is also ambassador to Belgium and lives in Brussels, as “persona non grata”. Fellow EU state Bulgaria said it was expelling Syria’s interim ambassador and two other diplomats in protest at the killings in Houla. Despite the show of protest, it is unclear whether the mass diplomatic expulsions will change much on the ground. Syria’s charge d’affaires in London has been given seven days to leave. “The international community is appalled by the violence that has continued, by the behavior of the regime, by the murder of so many innocent people,” British Foreign Secretary William Hague said. President Assad said the success of Kofi Annan’s peace plan depended on halting what he called terrorist actions and stopping arms-smuggling. Kofi Annan conveyed “the grave concern of the international community about the violence in Syria, including in particular the recent events in Houla”, the UN envoy’s office was quoted as saying by AFP news agency. Russia, which supplies arms to the Syrian government and has blocked UN resolutions calling for action against Damascus, has blamed both sides for Friday’s massacre. 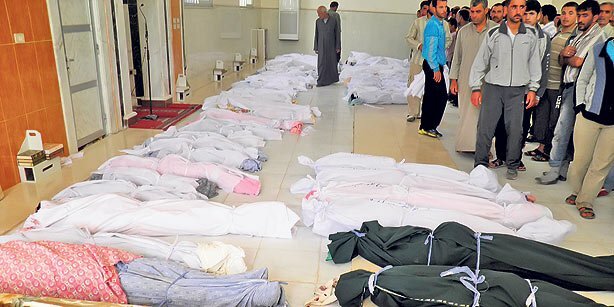 Its Foreign Minister, Sergei Lavrov, expressed concern that “certain countries” were beginning to use the Houla massacre “as a pretext for voicing demands relating to the need for military measures to be taken”. A meeting of the so-called Friends of Syria group is to meet in France in July, President Francois Hollande’s office said.